Welcome to Redeem the Commute. I’m Ryan, your host for the Money Course. Regardless of why you get into debt, what matters is that you don’t get stuck in debt. 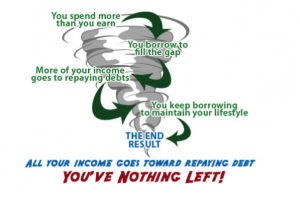 If you spend more than you earn, and borrow to fill that gap, then more and more of your money will go to repaying those debts, leading you to borrow more, until it’s all gone. If you’re stuck in this cycle, there is hope, and you may need help. There are lots of strategies out there. A professional can help you find the right approach for your particular situation. For example, some may tackle the smallest debt first just to get a sense of accomplishment and keep going. It’s financial better to clear the most expensive debt like Payday Loans since they are the most likely to keep dragging you down. Avoid anyone who claims they will increase your credit score for a fee, and some debt consolidation schemes – only use a reputable credit counsellor referred by a trusted source. Question: You may want to find a reputable credit counsellor near you to help stop this cycle. Visit https://www.capcanada.org/ or http://www.creditcounsellingcanada.ca/index.php?page=home for help finding a reputable credit counsellor near you.